America would be more equal, with this one change. Far too many children, especially from low-income families of color, fall behind in school. It starts early. Does early childhood education work? Should all kids go to preschool? How can you tell if a preschool is good? How many kids are in preschool? Why doesn't California provide preschool for all? A perennial question about education policy is "How can we close the achievement gap?" But let’s ask a different and equally important question: "Are there ways to avoid the gap in the first place?" There are never magic answers in education, but there is considerable evidence that an ounce of prevention is worth a pound of cure. Early learning programs are preventive: they head off achievement gaps before they happen. Learning gaps begin long before kindergarten. According to one Stanford study, for example, the language gap between rich and poor children begins in infancy. Stanford psychologists found that 2-year-old children of lower-income families may already be six months behind in language development. Heading off gaps from the start implies helping parents prepare for their role as their child's first teacher. Nurse-Family Partnership programs begin even before birth, working with new mothers. These "home visiting" programs include a trained specialist who supports families with medical, parenting and family education to give children with a strong start in life. Every dollar invested in high-quality early learning programs can save $7 later on. Very few people doubt the value of early education. Families with enough money enroll their kids in preschool programs and activities, usually starting by age 3 or 4. Children who begin their formal education in a good preschool start life with an enormous set of advantages. At a societal level, universal early education is almost universally acknowledged as a smart investment. Estimates of the long-term return on investment from preschool programs range from a low of 200%-400% (based on a meta-analysis of multiple studies) to 700% or more. These gains come in the form of fewer students being held back or getting involved in crime, and more graduating from high school and college and earning higher salaries in their careers. Many developed nations have taken action on this research, as indicated playfully in the crayon chart below. American families that can afford it send their kids to private preschool, but most kids are out of luck. Is Preschool a Magic Answer? No, of course not. Preschool belongs on the long list of things-that-are-not-magic. Educating kids is hard, and there are ways to mess it up. Trial preschool programs can appear to work exquisitely in small-scale tests, then turn out to work more modestly at scale. But the cumulative evidence is awfully persuasive. For example, logically it would make sense for the academic benefits of preschool to fade out over years of education. It ought to be hard to statistically discern the effects of preschool on seventh-graders. But more than a generation's worth of skeptical research on early education seems to prove otherwise: learning is cumulative. Like a snowball on a roll, knowledge tends to grow faster than it melts. Early education isn't magic — but investing in it is good policy. Failing to provide early education is foolish and harmful. Public preschool is expanding all over America, but availability varies greatly by state. The National Institute for Early Education Research (NIEER) at Rutgers collects and publishes data annually to help understand the changes and differences. Some states, notably including Florida, now invest in near-universal public preschool for four year olds. Vermont and Washington, D.C. have taken the next step — they provide free public preschool to nearly all of their three year olds, too. In California, by contrast, most kids still get their first taste of school in kindergarten. Why? It’s a combination of the high cost of private programs and scarcity of public programs. In San Francisco, for example, the median monthly tuition for private day care and pre-school is $1,700 for in-home programs ($20,400 annually) and $1,588 for center-based programs ($19,056 annually). Yes, that's more than tuition at UC Berkeley. The benefits of early education are rarely seriously disputed anymore. Expanding public education from 13 years (K-12) to 15 years would unquestionably make the state's education system more successful and more equitable. Of course it would cost money, but it's worth considering the big picture. In rough terms, making preschool universal would expand the public's direct investment in educating each student by something like 10%, not counting the one-time cost of new buildings and playgrounds. What does it mean for a program to be "high quality" when children are too young to prove what they have learned through tests? Should preschool be offered universally, like K-12 education, or should it be funded only for low-income families? Should it be completely public, or is it okay to incorporate existing private preschools through a voucher-funded system? If new schools or classrooms are required, who will pay for them? Should the building requirements resemble the standards for school buildings or for private home-based preschools? Should preschools be built as an expansion of the existing school system, or should they be separate institutions? As the debates rage on about the perfect vs. the good, time passes, always clockwise. Each year, another half a million children are affected by this inaction. The social science research about the characteristics of a “high quality” program leaves room for intelligent people to disagree. But as the debates rage on about the perfect vs. the good, time passes, always clockwise. In California there are about half a million children per grade level, so that is a good approximation of the scope of harm from inaction. The cost of year of public preschool in California (about $7,000 in 2018) is less than a twelfth the cost of a year of prison. In the big picture, expanding from today's 13 years of guaranteed basic education to 14 or 15 years may seem like a small addition, but the gap remains. California education suffered greatly in the Great Recession. As of 2017, the number of funded preschool seats in the state still had not recovered to pre-recession levels, despite the boom in the stock market and recovery in education funding. In the long run, children and families are only protected from budget cuts by public will, as measured in voters' willingness to tax themselves. There are signs of a growing consensus to expand early education in California. In 2018 Gavin Newsom campaigned for Governor with universal access to early education as a key pillar of his platform. Children Now, a non-profit organization, has been a consistent advocate for early education in California. Its web site is a good source of information about support for children in a variety of capacities including early education. When California eventually finds a way to invest in preschool, it at least will have done its homework. The state won a $70 million federal Race To The Top Early Learning Challenge Grant that supported development of a Quality Rating and Improvement System (QRIS), a set of tools to help local agencies collect and disseminate information about the quality of early learning programs. According to EdSource: "As of February 2016, only 3,300 of the more than 50,000 centers statewide had been rated. Evaluators are focusing first on assessing preschools and childcare facilities that serve low-income children and those with special needs." Are these programs any good? The Learning Policy Institute’s report, The Building Blocks of High-Quality Early Childhood Education Programs, identifies 10 important elements of high-quality early childhood education programs. How is California doing? Check their interactive map. Outside California, virtually all kindergarten programs are “full day,” which means they last five to six hours. Kindergarten attendance is not mandatory in California and in some schools here it remains three to four hours in length. The shift to full-length kindergarten is at last well underway in California, but in most other states this isn't even a conversation topic anymore. If your school still operates an abbreviated kindergarten program, you should be concerned. As usual, a good shortcut for figuring out what constitutes good education is to look at what happens in wealthy communities: they send their kids to enriching preschools. When California gets around to investing in preschools for all children, the state's K-12 schools will be much better positioned to succeed. Updated Feb 27, 2017 with new research about the lasting effects of early education. Updated May 31, 2017 with fresh data about how California compares. Updated Sep 29, 2017 with research about the Nurse-Family Partnership Program. Children enter kindergarten with roughly equal readiness to learn regardless of whether they attended preschool. Research shows that high-quality early learning programs have a high return on investment. California leads the nation in percentage of four-year-olds attending publicly funded preschools. This is a sobering statement and one we should be ashamed to have to live with: "As usual, a good shortcut for figuring out what constitutes good education is to look at what happens in wealthy communities: they send their kids to enriching preschools." I agree Susannah, it is sobering. The good news is, it's definitely not an endorsement of the status quo. The big point is that every child deserves a quality preschool education and California legislators (and voters!) have the power to make that happen. Which is why readers like you are incredibly important and have the ability to advocate for real change. The ounce of prevention approach (also good for health coverage!) seems such a no-brainer but obviously in so many arenas, people including legislators and educators are short-sighted. As I was reading the snowball analogy for the cumulative effects of learning (an effective analogy I think), I wondered how the seeming loss of knowledge at the end of a long summer fits into this; I suspect the seeming loss is really loss in immediate memory as opposed to more deeply buried accumulated knowledge. Hi Susannah, thanks for your comment. This is a great question you'll see addressed in Lesson 4.6. Spoiler alert--summer learning loss disproportionally affects low income children and the effects are cumulative. The education commission of the states (ECS) collected data about kindergarten policies in each state. California is not alone in having weak policies to provide kids in poverty with a decent start to their learning. Scientific America reports the largest study to date of publicly funded early education program shows a major, sustained educational boost. A new report from RAND finds even more evidence of the importance of early learning. "Investing Early: Taking Stock of Outcomes and Economic Returns from Early Childhood Programs "
"With this expanded evidence base, policymakers can be highly confident that well-designed and -implemented early childhood programs can improve the lives of children and their families." I definitely believe Preschool is important for our children to develop the social skills necessary as they embark in school the following year. What choice should you make if you don't have enough money for universal pre-K? 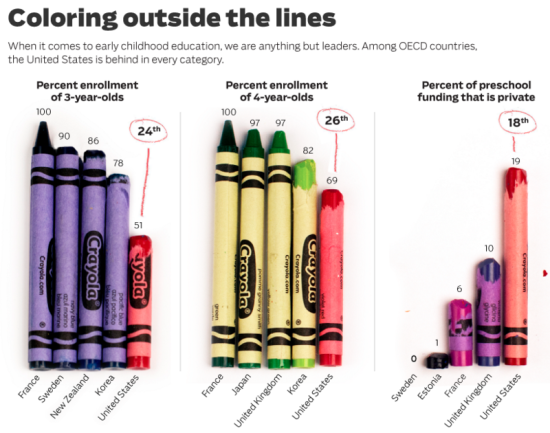 A 2017 study from Brookings suggests "that if limited resources rule out a universal program, then the best strategy may be to target pre-K services to disadvantaged communities rather than to disadvantaged children." A new study on transitional kindergarten contains good news. It found that TK Improves academic skills and engagement at kindergarten entry. More specifically, "The study found that TK gives students an advantage at kindergarten entry on all academic skills assessed. TK students outperformed comparison students on early literacy and language skills, including letter and word identification, phonological awareness, and expressive vocabulary, as well as mathematics skills such as problem solving and knowledge of mathematical concepts and symbols." California's school finance system creates a financial disincentive for school districts to offer a full Kindergarten program, so many schools still offer Kindergarteners a program of only three hours' duration. As EdSource documents, it's a money issue. There is a HUGE difference in the kids who have been in preschool and those who have not, thus making the Kinder teacher's job that much harder as she is almost teaching two different grade levels. * Publicly funder health insurance. "According to the National Survey of Early Care and Education (NSECE), 97 percent of center-based early childhood teaching staff are women – many of whom earn such low wages that they qualify for public benefits. (Center-based care includes school- based care, Head Start programs, and child care centers). These low wages undermine their ability to provide for their own families, as well as their ability to provide children with the high-quality early learning experiences they need to excel in school and in life." A national study comparing early learning throughout the nation finds that California is behind other states. A recent poll from the Public Policy Institute of California indicates an overwhelming majority (68%) of Californians see pre-school as important to K-12 success. Read more in our blog about efforts to increase support for early learning. Parents. Why don't we teach the parents how to educate their kids? Starting Day 1 , engage the kids in speech, conversation, activities, shared experiences. We know kids from parents with graduate degrees have thousands of more words by the start of school than HS grad parents and that gap is rarely closed. And after the first kid through the parent ed system, the second & others are "free"- requiring no further cost by the public sector. Pre School is too late. 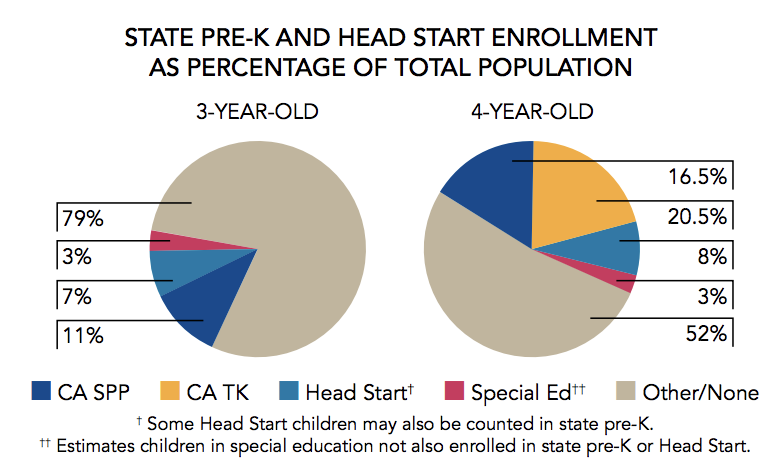 More than 33,000 California 4 year olds from low-income families are not enrolled in any of the publicly-funded school readiness program for which they are eligible, according to new policy brief Unmet Need for Preschool Services in California: Statewide and Local Analysis by the American Institutes for Research (AIR). AIR’s findings show that approximately 137,000 3 year olds are not enrolled. The report also includes a snapshot at the county and zip code level from 2014 showing where the unmet need for preschool is most acute. The policy brief follows the introduction of the Quality Early Education and Development Act of 2016 – AB 2660 (McCarty), which aims to establish a plan and a timeline for California to provide quality preschool opportunities to all children from low-income families. The Right Start Commission's new report, "Rebuilding the California Dream", recommends ways to address the challenges facing California's youngest kids. What Makes a Good Early Childhood Education Program? Drawing on a substantial body of research, the Learning Policy Institute recently published The Building Blocks of High-Quality Early Childhood Education Programs. This brief identifies 10 important elements, or building blocks, of high-quality early childhood education programs as indicated by research and professional standards. Finally...early education is a hot education topic in Sacramento. Catch this video seminar on Improving Quality in California's Early Childhood Education System: New Research and Implications for Policy. What is the impact of Transitional Kindergarten (TK)? Their study found that students who attended TK were significantly better able to identify letters and words at the start of kindergarten compared to their peers who did not attend. TK graduates also outperformed their peers on measures of mathematics knowledge and skills, including mathematics problem-solving skills such as counting objects and understanding measurement. Our district offers Preppy-K classes (their term for Pre-K) at 5 of their elementary schools. You must be 5 to enroll and for those students it is like a 2 year kinder program. In working in multiple kinder classrooms I have noticed how the students who went through this Preppy-K class are much more ahead then the those students that did not. Preschool is an amazing starting block for children and should be a part of all children's education. 8 of the 17 schools in our district have preschool on campus. The cost is significantly reduced (I believe in some cases free) for low-income families. If we had more affordable preschool options, our low-income families would be able to take advantage. My own children have attended one of the most affordable preschools in the area and even with a "six figure income" in our family, we struggle to afford it. Early education is essential to *preventing* the achievement gap we try so hard to close. Another important factor though is educating parents on WHY early education is so important. Just telling the families that it's free or affordable is not necessarily going to motivate them to enroll. My husband is in the Navy, and I am a homemaker. When I went to register our son for pre-K, I was told that we make too much money for him to go to the state-funded pre-K here in San Diego. Our son has an IEP for speech therapy, but that didn't matter. California needs to make public pre-K more accessible. We made too much money to qualify for free pre-K, but not enough to pay for the wildly expensive private pre-K. Our daughter got to go to pre-K for free in Plano, Texas simply because her dad is an active duty service member. Is what wealthy people do really such a good indicator of what's good for children? Maybe they are too busy to take care of their own children. And out of guilt they overspend on things that don't really help children. Is anything known about this? With greater discussion at the state and national level on the importance of early childhood education, a new report highlights how we pay those who work in this field. "... (A)s was true in 1989, childcare workers still earn less than adults who take care of animals,and barely more than fast food cooks." Increasing access to high-quality preschool is an essential element of education reform. We must also focus on early learning and development opportunities for California's infants and toddlers, as research shows gaps in learning as early as 9 months. Connecting children's early education experiences to their K-12 education is critical to supporting their long-term sucess. One example of how we can better align early learning and K-12 systems: utilizing data from kindergarten readiness observation assessments (KROA) to support children as they transition into kindergarten and move through the early elementary years.